Arriving fashionably late to review a darling of the Melbourne cafe press, here finally we have the Salford Lads Club. 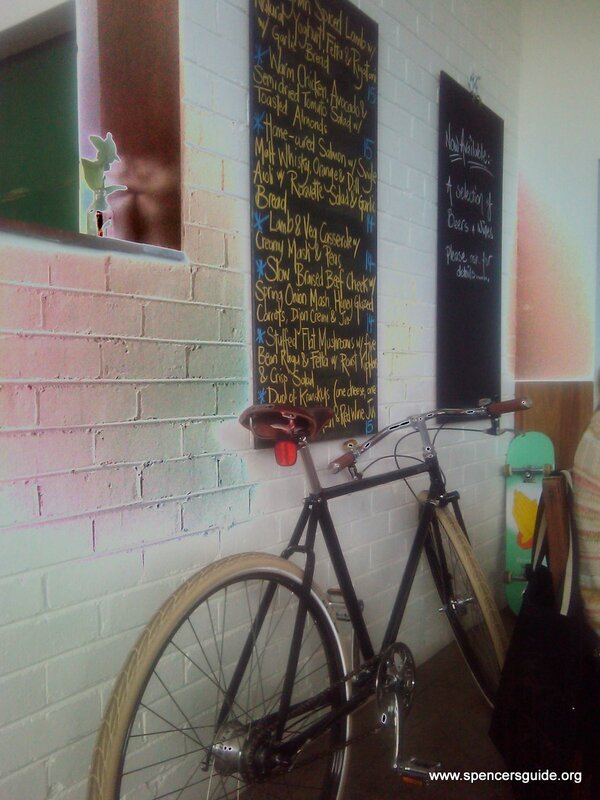 It has the warehouse chic, the Google provoking name, the random push bikes and the slightly aloof staff you'd expect from urban coffee junkees ... and it's in Port Melbourne! Well sort of. It could now be argued that Bridge Street is the place to be for hip cafes, as technically "the club" shares it with both My Sister Says and Balderdash, however tucked as it is behind Bunnings, it's off the map and at least a (brisk) fifteen minute walk away from pretty much anything. It likely wouldn't still be there if it didn't deliver a top notch espresso, but it's the food that really sets it apart. Although there is a small display cabinet for pides and the like, as its placement in both Cheap Eats and the Good Food Guide atests, the daily lunch specials are where it's at, with interesting restaurant quality dishes at pretty much cafe prices. It's well worth both the trip and inevitable initial akwardness as you first get accustomed to the set up.